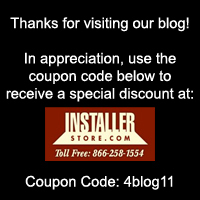 ← Installerstore – Merry Christmas to All! Find Castor Cups for Beds – That Work! Do you have a bed on wheels that constantly is sliding and moving around? How about that piano castor wheel that is leaving big dents in your hardwood? If you are looking for a product specifically designed to protect floors and stop furniture wheels from moving, we sell a great product made by the manufacturer Slipstick. The Castor Cups are available for Large Wheels (like those on beds with casters) and Small Wheels (like those on pianos and piano benches). The bottom of the Slipstick Castor Cups contain a specially formulated O’ring to protect floors and keep the furniture from moving. This product can also reduce pesky dents left in carpets by wheels. The Slipstick Small Castor Cups are ideal for Piano style wheels, or smaller wheels up to the size of 1 3/4″. Smaller wheels are usually found on baby cribs, refrigerators, washer/dryer wheels and much more! The Large Leg Coaster works great with wheels that are 2 3/8″ to 2 5/8″ in diameter, including beds on casters. You may also find this size of wheel on couches, dressers and office chairs. Besides choices in size, you can also choose from 2 colors: Carmel and Chocolate. The Carmel Colored Slipstick Castor Cups work great for lighter-colored furniture, while the Chocolate color looks great with darker-colored furniture. There are four Slipstick Castor Cups per package, or enough for one normal piece of furniture (4 legs). Protect your flooring investment from all of your furniture with Installerstore and Slipstick! We also carry a FULL line of felt and glide furniture feet options, including clear sleeve floor savers that go on over the chair leg for a more permanent option for your furniture.